MULRYJEWELS: Seen and Heard: Mulryjewels featured at Summer Recital! This past May I had the pleasure of being a part of the Westchester Summer Vocal Institute. The program, which involved an intense schedule of coachings, voice lessons, staging, Alexander technique, masterclasses, and audition classes all with amazing staff, closed in a gala recital of arias. It was a great night for opera AND for mulryjewels! 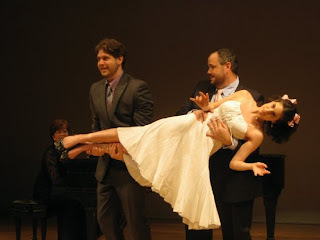 Featured above is Soprano Christina Kompar playing a DIVA in an aria from Mozart's The Impresario. Christina is wearing the "Crystal Ball and Chain" earrings. 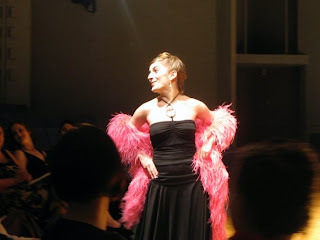 Below is Soprano Nina Camp singing the "Doll Song" from Offenbach's Tales of Hoffman. Nina is wearing the Crystal Ball Necklace in Crystal AB as well as the "Birthday Cake" pearl cluster ring. 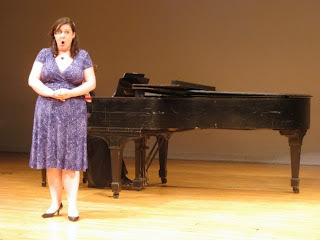 Then there's yours truly (Stephanie Horowitz-Mulry), singing Mimi's first aria from La Boheme. I am wearing the Puffed Heart in Purple Velvet as well as a Cluster ring. Performance pictures courtesy of the Shorestein family. I was so proud of everyone and I have made a whole bunch of new friends! THANKS to all!! Opera and Jewelry make a great pair!